I'm writing this letter after being involved with you for two weeks (as you know) in a firestorm of public controversy over one of your ministry partners, Chris Pinto, and Pinto's use of a questionable source in two of his films. In hindsight, I can understand how you feel my comments about Pinto were an attack, and I sincerely apologize for causing you distress in this way. Also in hindsight (and even though this matter is not one to be governed by the Matthew 18 principle, as it is about public teachings in the public arena and not a private offense to be handled privately), I still wish that as a courtesy, I had called you to let you know that I was questioning the credibility of Chris Pinto's source. But maybe this will all make more sense if I back up a little and explain how this played out on my end. A Christian friend of mine had asked me several times to view a particular video and to give her my critique of it. I had watched the film some years before (without realizing that it was produced by Pinto, your ministry partner, referenced above), and already knew that it was about conspiracies and secret societies, so I didn't have any interest. And I will make full disclosure here and state here that the idea of secret societies all being connected in some vast conspiratorial web of evil did captivate my thinking for a season early in my Christian walk. In looking back, I think these ideas fed into what I can only describe as a morbid curiosity that I had about such things, along with perhaps a desire for hidden knowledge in this uncertain world (though Deut 29:29 tells us that "The hidden things belong to the Lord."). I did, however, remember that the video my friend wanted me to watch specifically named a number of secret societies (including the Illuminati, the Bilderberg Group, Bohemian Grove, etc. 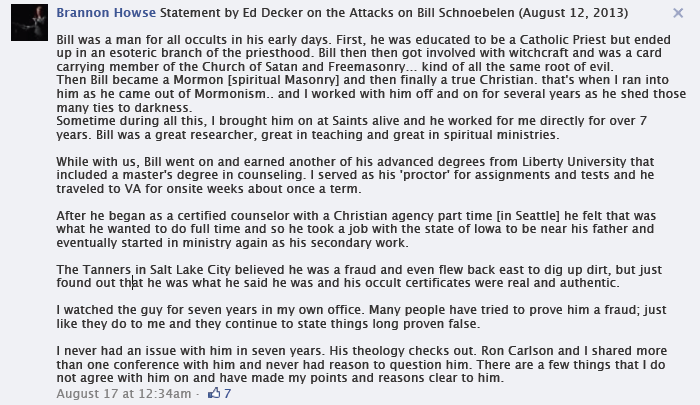 ), and that got me to thinking about how much time a Christian should focus on evil conspiracies. After all, don't we already know all that we need to know about evil conspiracies from God's word? And by that I mean, regardless of whether or not there is a cabal of wealthy and elite power brokers meeting in smoke-filled rooms to plot spiritual mischief (and there is little to no actual evidence to support such claims), we already know that the ultimate evil conspirator is not so much personified in wealthy elitists, but rather in Satan himself. And yes, Satan does always have minions ready and willing to do his bidding in every generation, but aren't we to keep our eyes and focus fixed firmly on Christ? And also, where in Scripture do we have teaching that we should focus on these evils? When Paul was wrongly thrown into prison, did he say, Now look, just how far up does this conspiracy go? We've got to get to the bottom of this! No, he continued to be about the gospel, writing letters to his brothers and sisters, exhorting them back to the purity and simplicity that is in Jesus Christ and him crucified for the forgiveness of sin. And for the record, before someone calls me out for doing what they think I was cautioning against, as a discernment writer, I do not research alleged conspiracies; I examine beliefs and teachings that are known to be in our churches right now, and which trace directly to the occult or the New Age (such as yoga, contemplative prayer, mysticism, etc.). These teachings can be fought with the only offensive tool the Christian has, and that is the sword of the Spirit, which we employ by cutting away all that is false. But we can't cut away the false if we don't know what is true.....that is why in Scripture we are constantly exhorted to doctrinal purity. So when I brought up the point that John MacArthur, Phil Johnson, Steve Lawson, R.C. Sproul, etc., had not (to my knowledge) ever publicly taught about the Illuminati, it was only because it had occurred to me, in a strangely encouraging sort of way, that the pastors I have learned so much from in my Christian walk had never given any time that I knew of to these secret societies thought to be connected in a vast conspiracy of evil. And I don't think this is because it's just not their area of expertise, as I have heard. What I suspect is that they ARE familiar with this line of thinking out there but that they reject such conjecture as unwholesome and unedifying. After all, you can't hold a mist or a shadow or something that might be real up to God's word; you can only hold actual teachings up to it. However, at my friend's continued prompting, I did pick up the video in question and started watching it, and to my surprise, I realized that the creator of this video was Chris Pinto, a Worldview Weekend speaker you are in active ministry with. At the time that I originally watched this video (some years back), I did not know this. At that time, I had never heard of him. But once I started watching, I immediately recognized his voice from having listened to him in his appearances on your radio show. I continued to watch the video and was concerned a few minutes into the video when someone I was very familiar with appeared on the screen: William Schnoebelen, who was used as a source in the video in helping to build the case for how secret societies have conspired to secretly "bury" occultic symbols in the landscape around us. But even more disturbing than the sensationalistic aspect of Schnoebelen's vampire and UFO claims is the fact that Schnoebelen is also unabashedly a King James Onlyist (claiming that when he casts demons out of people, no other Bible translation "reaches" them besides the KJV), embraces the Hebrew Roots Movement, and holds (as just noted) to false Spiritual Warfare/Deliverance teachings. "(W)earing a Tallit(Prayer shawl) can provide additionally spiritual “covering” while in prayer." "If you are able to procure one and blow notes on it, a Shofar is another powerful tool from Israel......There is so much more that could be said about the Shofar as a spiritual warfare tool, but space does not permit here. If you have a Shofar, I would recommend blowing it prayerfully every day during the days of Tisha B’Av." "(A)nother stronghold-shattering prayer that can be used is to recite the SHEMA out loud in the morning and at night before you go to bed (Deut. 6:4-9). Proclaiming it in English is good, but doing it in the actual language of the Torah – Hebrew – is better. Even if you just proclaim the two main verses, that is powerful. Here is how to say it phonetically in Hebrew: SHAY-MAH, YIS-RAEL, YAHU-WAH ELO-HAY-NU, YAHU-WAH ECHAD! BA-RUCH SHEM KA-VOD MAL-CHUTO LE-O-LAHM VAED. (“Hear O Israel, Yahuwah our Elohim, Yahuwah is One. “Blessed be the Name of His glorious Kingdom for all eternity.”)"
"When the (Feast of Trumpets) begins, if you have a shofar, BLOW it! If you do not have one, or find it hard to get a proper note out of it; you can easily find sound or video files on places like YouTube that can provide you with a digital shofar note. It is better than nothing.......The SHOFAR’s sound will help crack through the shells of our own self-deception so that we can really enter these prophetic times ready to do BUSINESS with Yahuwah, forsaking all else (including all our sins) to only follow Him and His Word!" For anyone interested in reading further on this topic, there are several links on our sidebar that address both the KJVOnly issue and the Hebrew Roots Movement. The King James Onlyism and the Hebrew Roots Movement connection are particularly troubling, in that these teachings add a yoke of law/legalism to the Christian that God never intended for us to have, and which are direct attacks on the purity of the gospel, and the simplicity that is found in Christ alone. When I raised my head from researching William Schnoebelen, I realized from comments on my Facebook wall that my questioning of Schnoebelen as a credible source was being perceived and portrayed as a personal attack against you. It was also reported to me from multiple sources that comments had been lifted from my wall by a few women and were being ferried back to you and Chris Pinto in order to whip you both into a frenzy. These comments were taken from the William Schnoebelen and Illuminati posts I made on my Facebook wall. Please note that I still stand by what I said in those threads, and that I'm not embarrassed by anything that was stated in either of those threads, as I never questioned the salvation of you or Chris Pinto, never called either of you names, and never charged either of you with heresy. 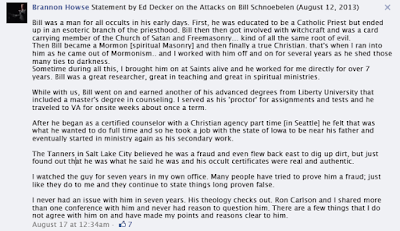 I stood (and still stand) by the comments I made, and so those threads are still available on my Facebook wall to this day for anyone to see (here is the Illuminati post, and here is the William Schnoebelen post). "Brannon, I am NOT trashing you.....no matter what you have been told. But I would like to talk, not tonight though......You asked me a couple of years ago if I have any concerns about Chris Pinto.....well.....I do..."
I emailed you with my specific concerns about Chris Pinto's video and the use of William Schnoebelen as a source. I emailed Chris Pinto with my concerns about the use of Schnoebelen as a source. I again texted you saying: "Brannon, can I call you?" but received no response. 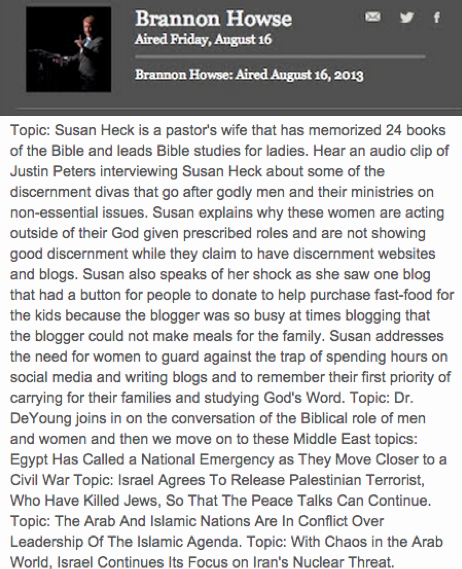 "Susan explains why these women are acting outside of their God-given prescribed roles and are not showing good discernment while they claim to have discernment websites and blogs." Again, this was presumably about my having raised concerns about your ministry partner Chris Pinto, and Pinto's focus on symbols, conspiracies and secret societies (such as the Illuminati). And again, while your notes characterized this as Susan Heck's stance, this is not quite what Susan Heck said in the actual show. Also, is it too obvious for me to point out that raising legitimate concerns between brothers and sisters in the faith should be all right do, as long as this is done without name-calling, slandering or calling into question one's salvation? And that such concerns being raised shouldn't be characterized as "going after" another ministry, or with the insinuation of sin, such as insinuating that I, as a wife and mother, am in sin and overstepping my "God-given prescribed role" by raising concerns? Is it also too obvious to point out that as long as my household is not out of line (i.e., I am tending to my marriage, my husband, my children and my household), that I have every right to publicly discuss theological issues? As soon as my husband and I saw the program notes for the August 16 show, and realized that you were misrepresenting the facts and publicly slandering me, albeit in a veiled way, we both commented on your Worldview Weekend Facebook ministry wall in an effort to make contact with you and move toward reconciliation, since you had not responded to my private efforts to reach you. We commented on the public thread on which you had posted your program with Susan Heck. Within minutes, however, you deleted our comments and blocked us both from commenting further. (I would have linked to this thread in order to show that our comments were not unkind, slanderous or personal, but this thread has been deleted from your wall.) I have attached our comments below. I made it clear, however, when I linked to this particular article that it was from a secular source; in other words, I made it clear that this was not an article that was being written from a Christian worldview but that this was an article written by secular source who was calling into question Schnoebelen's Mormon credentials and claims. So please don't get hung up on the fact that the author of the article is confused about true Christian beliefs (as all lost people are). Please just consider the legitimacy of what that author said about Schnoebelen. I have still received no communication from you, despite my calls and texts to you, and despite the efforts made by a mutual friend to mediate between us. Chris Pinto emailed me once, yesterday, with the same public statement he released to the general public, and that is all. So in closing, Brannon, yes, my concern started out over occultic symbols and secret societies, but my concern over William Schnoebelen being used as a source is far greater. To state that I have concerns about William Schnoebelen being given credibility and affirmed by you is an understatement, to say the least. And in saying that, yes, I have been made aware that on August 19, you stated publicly that I am "making stuff up" (and am a "tale bearer" and "an embarrassment to the Lord and His church") because I have written that you have given credibility and affirmed William Schnoebelen publicly. 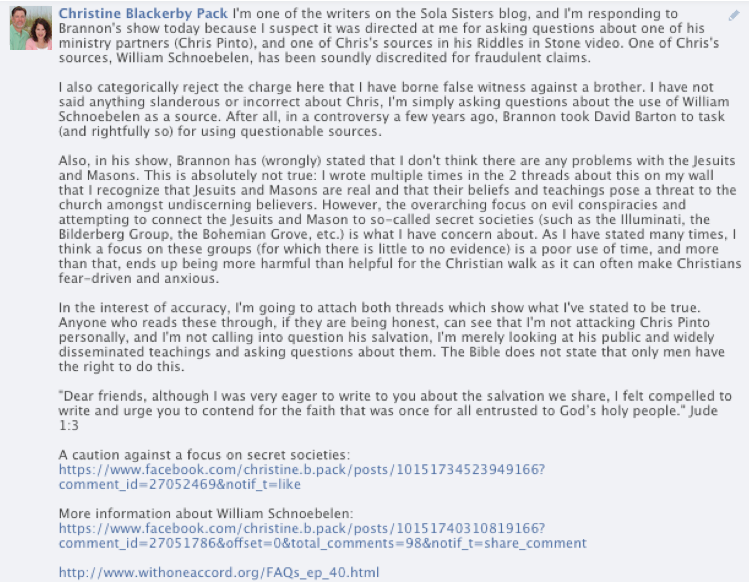 But Brannon, I can also assume that you are giving him credibility since you allowed him to come onto a comment thread on your wall on August 17 (2 days earlier), and post an article in defense of his ministry, which you affirmed with your own personal comment that you were glad he could come onto the thread to "speak up against those who are bearing false witness" (presumably me). You also personally posted an article by Ed Decker in support of Schnoebelen, and yet you deleted comments that I and my husband made, and then blocked us from being able to further comment. But of course, people are free to weigh the facts and look at the evidence presented here, and then they can certainly decide for themselves on this matter. It's very important, for the sake of the gospel, for Christians to use credible sources, otherwise we end up becoming even more of a laughingstock to the world than we already are. And didn't you yourself say something similar (and rightly so) with respect to David Barton some months back? However, at the same time, I recognize that people can make mistakes (I've made plenty). I also think that Chris Pinto, who used Schnoebelen as a source for his film, is a highly gifted filmmaker, and I have never questioned his or your salvation in all this (no matter what anyone may have said to you to the contrary). I have also heard both you and Chris Pinto give a very clear and unambiguous gospel proclamation many times over. So having said that, do you understand how Schnoebelen's legalism (King James Onlyism, Hebrew Roots Movement) could actually be a snare for anyone introduced to him through Chris Pinto's videos? And could actually fight against the clear gospel proclamation that I know you both want to make? In closing, let me state that I'm not embarrassed by anything I wrote, and I still stand by everything I've publicly posted. In fact, everything I've posted on this subject is still up on my wall for anyone to look at. And I think that anyone who takes the time to look at the threads can plainly see that I've never called your salvation, or Chris Pinto's salvation, into question, never charged either of you with heresy, and never called either of you names (as was incorrectly, and thus slanderously, stated by both you and Chris Pinto multiple times). I just have concerns about, and disagree with, the direction Worldview Weekend seems to be going in, and I have every right to state that I have concerns about that, as long as I do so in a gracious manner. And I would even go so far as to say that legitimately, as an ex-occultist, I have every right, even a responsibility, to exhort my fellow Christians to biblically think through the topics of symbols/secret societies/conspiracy theories, and put them in their proper place in the Christian walk. Christians aren't meant to walk in fear of the Devil's schemes, but by being undergirded with the truth of God's word which commands us to fear ONLY the Lord (Prov 1:7 “The fear of the LORD is the beginning of wisdom”). I'm making this letter public because I don't know of any other way to reach you right now. After giving what I thought was a calm and measured statement on your Facebook wall, my comment was deleted and I was banned from your wall, meaning I can no longer comment there. I've made repeated attempts to get in touch with you, which the above timeline documents, and which you are aware of through our mutual friend who attempted to mediate between us, but have received no response from you. But I am still hoping for this breech between us to be repaired, and I hope you can see from the timeline I laid out above that there was no desire to ambush you or personally attack you.